Great news: The proofread 1955 puzzles are now done and, thanks to Jim Horne, should be up on XWord Info soon! And I just sent off the second-to-last batch of proofreading yesterday—only one more packet remains! As for puzzles, this week Denny Baker started us off Saturday morning with 13, then another 13 Sunday night. Monday afternoon Mark Diehl sent 13, then 13 more that night. Late Wednesday afternoon, while waiting for a flight at JFK, Mark sent 13 more (reminding me of the days when he'd litz on the go—see the August 10, 2012, post!). Then early Thursday morning Todd Gross sent 13 more puzzles, in which he found 37 mistakes. Thanks so much again, everyone—we're almost there! I'll be graduating from high school next Thursday and then staying up all night for Grad Nite at some secret location in Southern California, so the next blog post will be in two weeks—right before I leave for ideacity in Toronto! Congratulations to Howard Barkin, who not only was the first to solve last week's very tricky Blast! challenge but is also a three-peat winner! Howard sent in the correct answer (and managed to break Mark Diehl's amazing winning streak!) on Sunday after just two letters had been revealed. 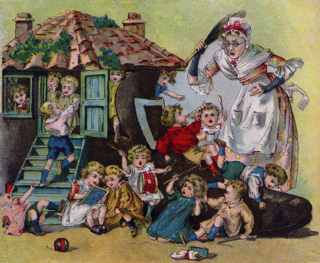 The clue, from the March 14, 1952, puzzle, was "Status of the children of the old woman who lived in a shoe." The answer: UNDERFOOT (as in the illustration below!). As usual, there's a new Blast! challenge up in the sidebar—the name of the first person to solve it correctly will be announced in two weeks! Following up on last week's post about C. E. Noel—which may have been a pseudonym for Charles Erlenkotter—I received an e-mail from Denny Baker, who said he'd guessed that the "C. E." stood for Christmas Eve (since the puzzle appeared on December 24). This is a very interesting possibility too, especially since quite a bit of time had elapsed between the publication of this puzzle and Charles Erlenkotter's preceding puzzles in the Times. I finally bagged the big one. The one who started it all at the NY Times: Charles Erlenkotter. I'd tried in the past, and didn't find much even though I had a "secret" advantage: I had an address for him. In Montreal. 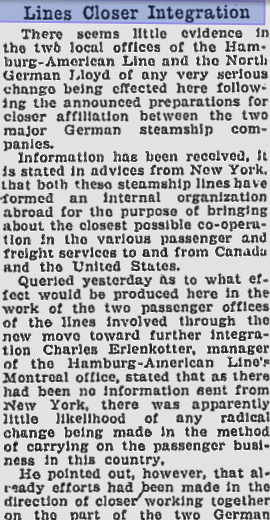 I found a couple of articles in the Montreal Gazette that mentioned he was the manager of the Montreal office of the Hamburg-American Line. I'm enclosing one from 1933. The Hamburg-American Line is actually pretty interesting in its own right. The company managed to survive two world wars (much of their fleet was taken as war reparations in both wars) to merge into Hapag-Lloyd in 1970 (they're the Hapag part). But back to Charles: I'd assumed he was Canadian given the address and the lack of info on Ancestry (my membership only covers U.S. records, I can see the existence of foreign records but I can't look at them). But this time Ancestry.com was more helpful. I'll get to that in a bit. First I should probably mention an interesting blurb I found in a NY paper Daily Argus in 1937. It says that Louise Erlenkotter of White Plains had passed away and left $3,500 to her son "Charles Erlenkotter of Montreal, Can." So that ties Charles to upstate NY, which connected him to records I got from Ancestry.com. Courtesy of The Daily Argus, January 25, 1937. As the Ancestry bio shows, Charles Erlenkotter was born in Hoboken, NJ on 9 Jun 1881 and passed away 26 Sep 1948 in White Plains, NY. I don't know when he returned to the US, and alas I haven't found an obituary...or any other document that verifies that date, but Ancestry seems rather sure about it. Fascinating finds, Todd—thanks so much again for all your great research! FYI, threepeat means three in a row... no disrespect to Howard's accomplishment!